This was first humorously articulated by Cyril Northcote Parkinson in a essay published in The Economist in 1955. Hence the naming rights. And I’ve seen this Law in evidence for most of my professional life. Purchase a new CRM tool to streamline the sales and marketing process? Instead of freeing up time for market research, you’ll find you’re just processing more data in the same amount of hours. Decide to hire an assistant to offload some of your responsibilities? Your schedule is guaranteed to be no less dense. The demand for your time increases with the availability of that time. But don’t confuse this Law with Michael Pollan’s “Snackwell Effect,” which is based on the self-defeating phenomenon where people eat more low-calorie cookies (like the Snackwell brand) than they would eat regular-calorie cookies. The same applies for agave nectar, which as a replacement sweetener should actually be used in smaller amounts than the equivalent honey or sugar. In these cases, I believe the stomach expands to fill the available notches on your belt. Has anyone else noticed how every pricey light bulb now has a life span estimate? From a marketing perspective, I do love the concept: invest more up front, but save on energy and materials costs over the long run. Seems like a win-win situation. But is it really? When one of our kitchen ceiling halogen floodlights expired last spring, I decided to play consumer reporter. 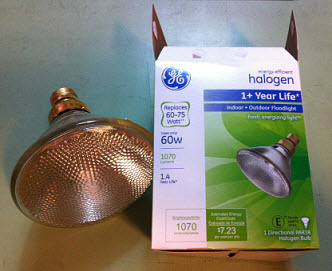 I replaced it with a $13 GE energy-efficient 1+ Year Life 60W Indoor Outdoor Floodlight. The box (see to the right) promised a “1.4 Year Life,” based on 3 hours of use/day. To remember exactly when I installed the bulb, I hid the packaging and receipt on the soffit near the fixture. Our Usage: Let’s be generous and say we run our kitchen lights for an average of twice the number of hours a day (6). Ignoring any complicated issues, such as increased heat and bulb stress for running longer hours or surges in the system, that suggests is should still last half the promised life or 0.7 years. That equals 255 days, or roughly. 8.5 months. Remember as well that this was inside use, well away from any inclement weather. Falling short: I screwed in the bulb on April 7, and it left the worldly plane on September 23. That’s 170 days, or only 2/3 of our more conservative estimate. Certainly a lot less if our average daily use was more like 4-5 hours. An Absence of Value: I’m trying to lower my energy footprint, and GE Lighting is all about energy savings; they even host a calculator on their Web site to see how much energy you will save with their products. Given the truncated life of my purchase, I’m sure I saved no energy – and no money – at all. I suggest they drop the price by a third to align the cost with the actual life span. Or maybe add more realistic environments to their testing facilities. A Failing of the Brand: If I decided to take my issue directly to GE, I’d be SOL. The box has no standard customer satisfaction or contact information, nor any form of guarantee that the bulb will actually last the promised extended life. GE Lighting puts itself out there as a trusted lighting brand, so why make a claim it won’t stand behind? I bought into GE’s spin, but I’ll think twice the next time around. Not an Isolated Instance: You’re thinking at this point that maybe I bought a lemon, one of the 2-3 defects out of 1,000,000 promised from GE manufacturing’s reliance on Six Sigma methodologies. But you’d be wrong! I will now reveal <drum roll> that I bought TWO of the same bulbs on April 7, 2013, and that I installed the second bulb in our kitchen ceiling only a few days after the first! And wouldn’t you know it, but nearly one week after the first flamed out, the second bulb also bit it, perhaps in sympathy for its lost incandescent brother.